7 Ways to Get More Comments on Your Blog Posts | AdsWiki - Ad Network Listing, Reviews, Payment Proof & Advertising News. Getting lots of comments on your blog posts is a wonderful feeling and also great for business! Not only do you feel good when someone writes an appreciative note, but having comments on your blog can also add credibility as it represents engagement, community and social proof. Don’t be afraid of people commenting on your blog either, unless you have a complete troll who simply needs deleting, intelligent arguments can be a fantastic source of traffic and conversation! 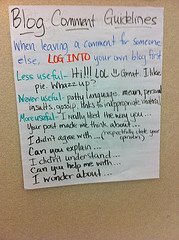 Would you like to learn how to get more comments on your blog? If you get people thinking or in some way solve their problems, generally they will feel compelled to comment! Sometimes the more controversial you are, the more comments you’ll get, though please always be constructive and remember to Add Value! Ask people if they found your post helpful? Have they got any other tips they would like to share with you? A call to action at the bottom of a blog post, similar to this one will increase your comments no end. People like direction so give it to them! Sometimes people need to fill in a lot of details like, name, email, website address, etc. to leave comments. This is a big No No! Make it easy for people to respond to you! Use easy commenting software like DISQUS or CommentLuv. We touched on engagement above, this is hugely important. The more you build a relationship with your commenters, the more they’ll come back to comment! Always respond when someone comments on your blog. People don’t have to read your information, there’s more than enough out there, so let them know how much you appreciate them! If you comment on other blogs and let the blogger know that you like their website and their content, they will want to return the favour by commenting on your blog. The beautiful human law of reciprocity! So take just a few minutes every day to comment on other blogs that you find useful / helpful. These are just a few tips to get you going. If you stick to them regularly, you should start seeing a lot of genuine people commenting on your blog posts. Now it’s your turn. Do you get a lot of comments on your blog posts? Are there any tips on you would like to share with us? Please leave your comments in the comments box below. 2 Responses to "7 Ways to Get More Comments on Your Blog Posts"
Thanks to the author of this awesome blog to share such agreat article on 7 Ways to Get More Comments on Your Blog Posts.Now i learned from this website that how i can increase comments on my website and only on this website i also get to know about all ad providing network .feeling much glad on being here. It’s perfect time to make a few plans for the longer term and it’s time to be happy. I have learn this post and if I may I wish to suggest you few interesting issues or tips. Maybe you could write next articles regarding this article. I want to read even more things about it! How To Make Money With Twitter Using TweetAdder, SponsoredTweets, Amazon Affiliates, and ClickBank. The Best Way to Get Paid - payoneer.